Description of "From Ordinary to Entrepreneur"
Being an entrepreneur is a wish for everyone but the way is tough enough. 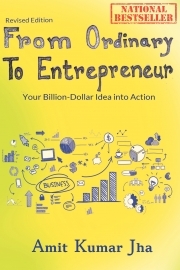 This book by Amit Kumar Jha lets you understand all about being an entrepreneur, the life of an entrepreneur, the legal terms, protective measures and all the tips so that you can direct yourself in the right way. The books also let you understand the ways to take a maximum risk in a simplified way and finally gives you the billion-dollar idea that has the potential to change your life. This book is a must to read if you are on the plan to be the next billionaire. Amit Kumar Jha is an Indian Entrepreneur, blogger, Author, motivational speaker, trainer, programmer and web developer. He was born on 10th October 1986 and has started coding since his sixth standard. Amit Kumar Jha is also the founder of WEBNext Labs and iPehchan. He has also received Governor’s Medal for his Adventurous activities and received a large number of rewards throughout his career. Amit Kumar Jha believes in the fact that nothing can prevent a person from being a great entrepreneur or a programmer if they have the desire to be one. Reviews of "From Ordinary to Entrepreneur"